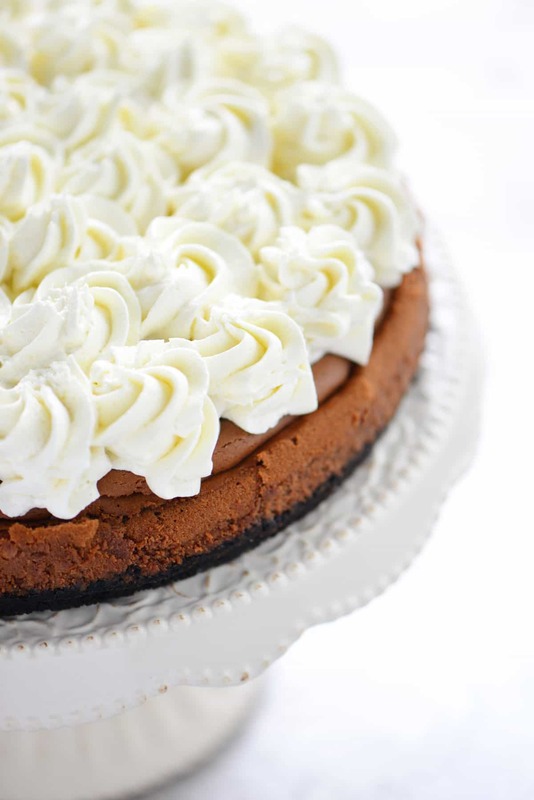 Triple Chocolate Mousse Cheesecake is smooth, creamy and full of chocolate goodness. From the Oreo crust to the white chocolate mousse top, it is amazing! And by the way, I received a free copy of the Cheesecake Love cookbook to try. Cheesecake is so delicious but it can be really expensive to buy already made so why not make it at home? 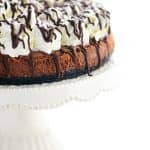 This Triple Chocolate Mousse Cheesecake has chocolate in all the layers with Oreos for the crust, bittersweet chocolate in the center, white chocolate on top, and semi-sweet chocolate drizzle! 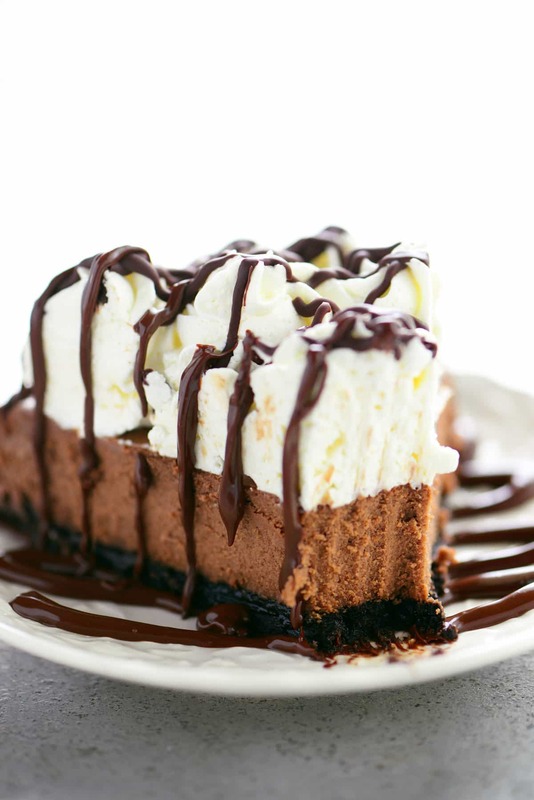 The triple chocolate mousse cheesecake! I don’t know that I’ve made many baked a cheesecake in a springform pan before like the traditional cheesecake you get from a restaurant. I’ve made no bake cheesecake in a springform pan and cheesecake dessert in a 9×13 pan but not like this. Jocelyn’s instructions were easy to follow and the cheesecake turned out perfectly! I can’t wait to try making more of the cheesecakes in this book and the next in line is called Espresso Cheesecakes which are mini in size. 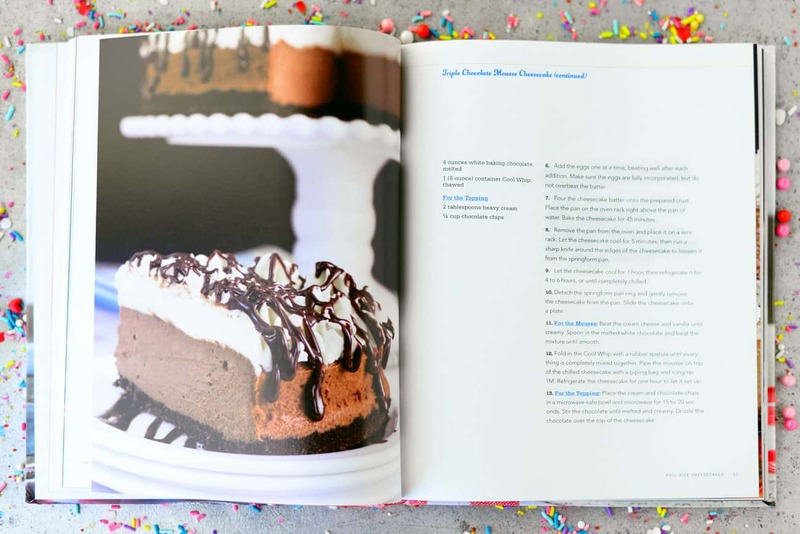 The Cheesecake Love cookbook includes full-size cheesecakes, cheesecake cupcakes, cheesecake bars & bites, no-bake cheesecakes, cheesecake brownies, cheesecake pies, breakfast cheesecakes, and out of the box cheesecake desserts! 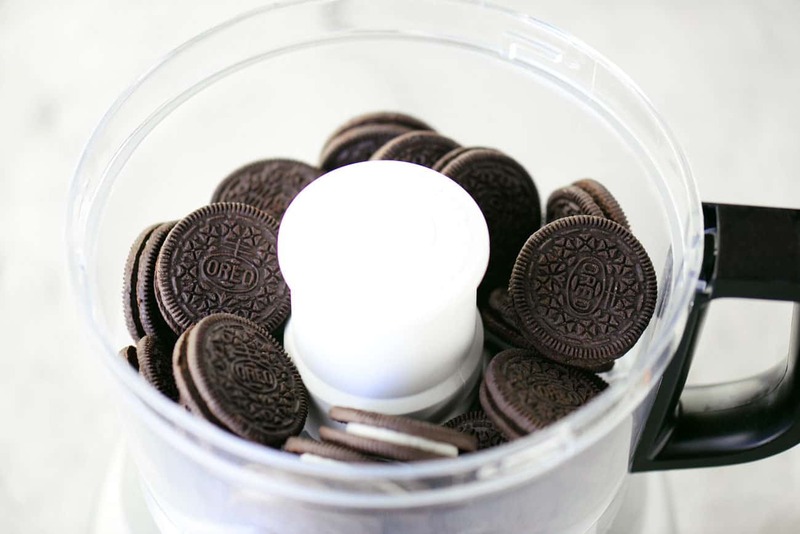 Crush the Oreos until they turn into crumbs. You can use a food processor or a place them in a gallon sized zip top bag and crush with rolling pins. Stir in the melted butter and press into a springform pan lined with parchment paper. I find that using the flat bottom of a measuring cup helps with this step. Beat the cream cheese until creamy. Add the sugar, sour cream, and vanilla and beat until very smooth. Spoon in the melted chocolate and beat until incorporated completely. Add the flour and beat again. Add the eggs on at a time, beating well after each addition. 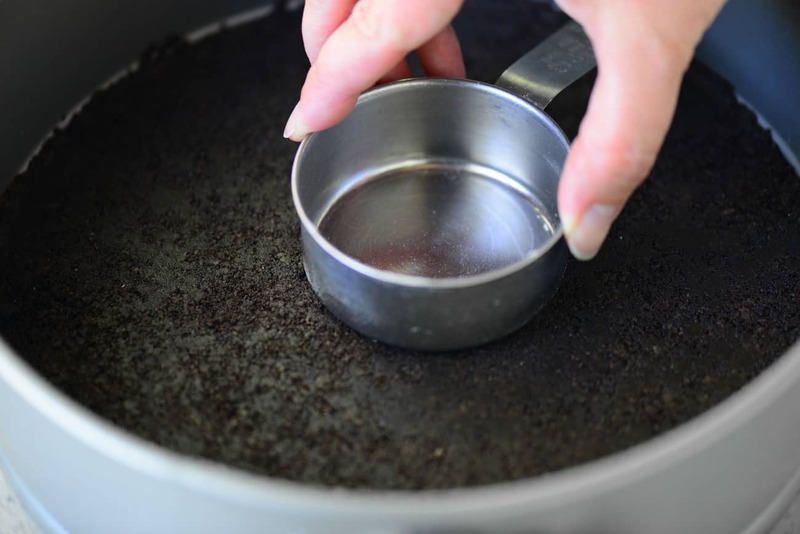 Make sure the eggs are fully incorporated but do not overbeat the batter. Pour the cheesecake batter onto the prepared crust. Place the pan on the oven rack right above the pan of water. Bake the cheesecake for 45 minutes. Remove the pan from the oven and place it on the wire rack. Let the cheesecake cool for 5 minutes, then run a sharp knife around the edges of the cheesecake to loosen it from the springform pan. 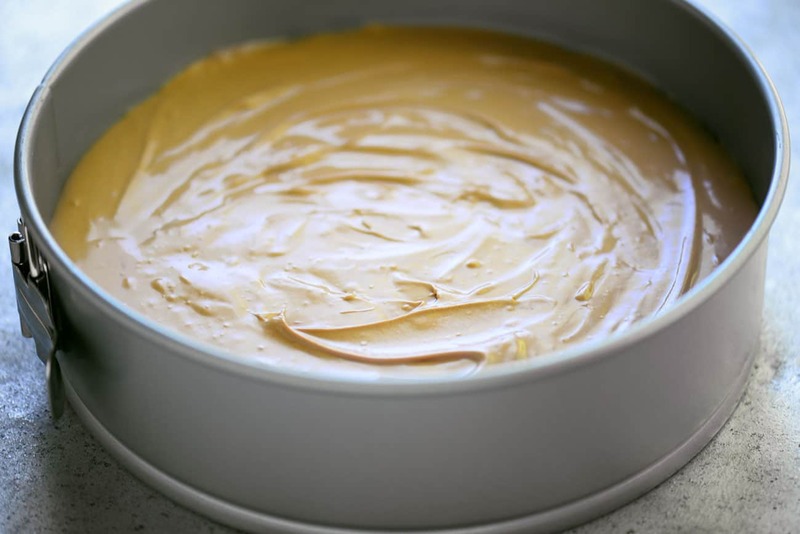 Let the cheesecake cool for 1 hour, then refrigerate it for 4 to 6 hours, or until completely chilled. Detach the springform pan ring and gently remove the cheesecake from the pan. Slide the cheesecake onto a plate. Fold in the Cool Whip with a rubber spatula until everything is completely mixed together. Pipe the mousse on top of the chilled cheesecake with a piping bag and icing tip 1M. Refrigerate the cheesecake for one hour to let it set up. My teenage daughter brought this Triple Chocolate Mousse Cheesecake to her friend’s birthday party and everyone said it was soooooo good! There weren’t any leftovers! Place a large rimmed baking sheet on the very bottom rack of the oven and fill it halfway with water. Preheat the oven to 350°F. Line a 9-inch springform pan with parchment paper. Beat the cream cheese until creamy. Add the sugar, sour cream, and vanilla and beat until very smooth. Spoon in the melted chocolate and beat until incorporated completely. Add the flour and beat again. Add the eggs on at a time, beating well after each addition. Make sure the eggs are fully incorporated, but do not overbeat the batter. Pour the cheesecake batter onto the prepared crust. Place the pan on the oven rack right above the pan of water. Bake the cheesecake for 45 minutes. Remove the pan from the oven and place it on the wire rack. Let the cheesecake cool for 5 minutes, then run a sharp knife around the edges of the cheesecake to loosen it from the springform pan. 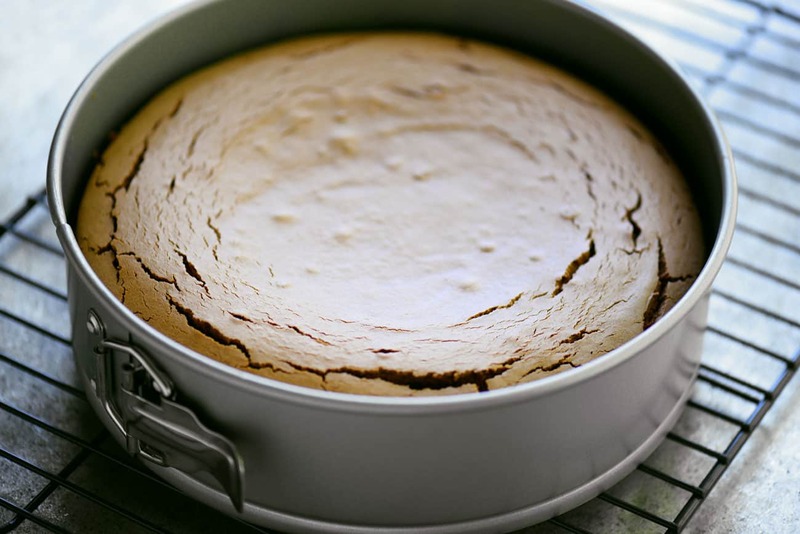 Detach the springform pan ring and gently remove the cheesecake from the pan. Slide the cheesecake onto a plate. 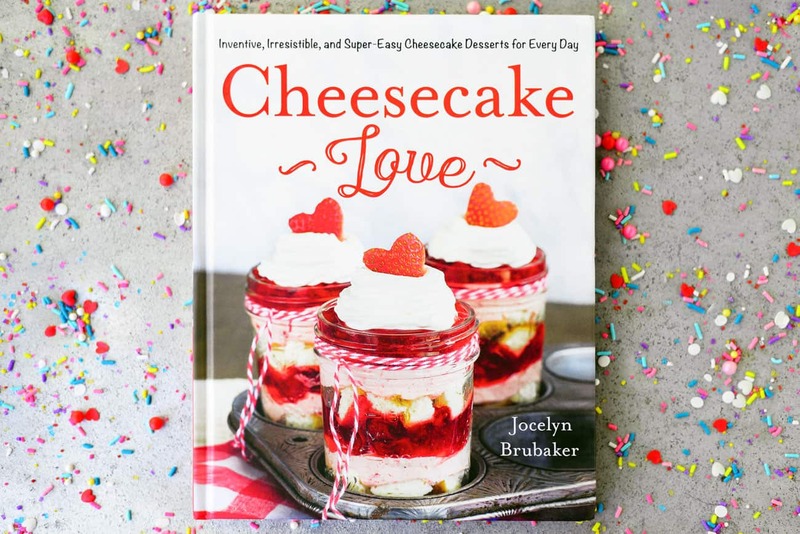 Excerpted from Cheesecake Love: Inventive, Irresistible, and Super-Easy Cheesecake Desserts for Every Day by Jocelyn Brubaker. Copyright © 2017. Reprinted with permission from St. Martin's Press. All rights reserved. 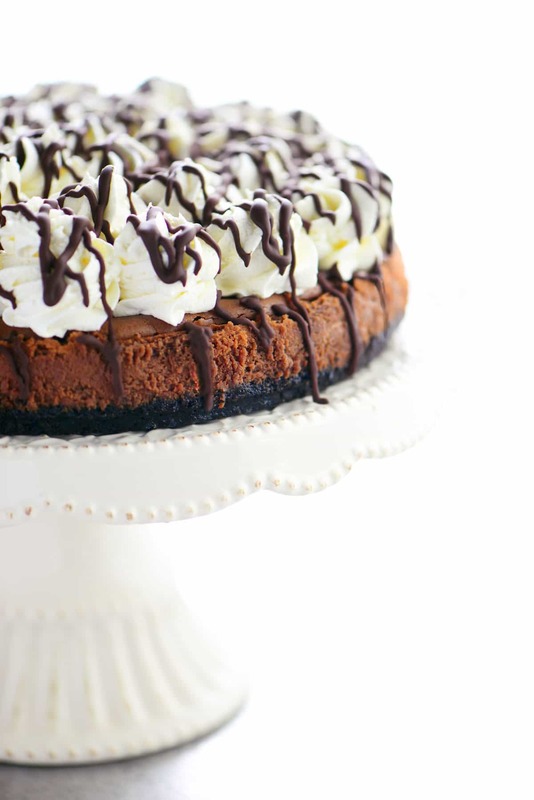 We are serious chocolate lovers around here, so this cheesecake will be made soon! The photos are drool-worthy! Thank you Kathy! 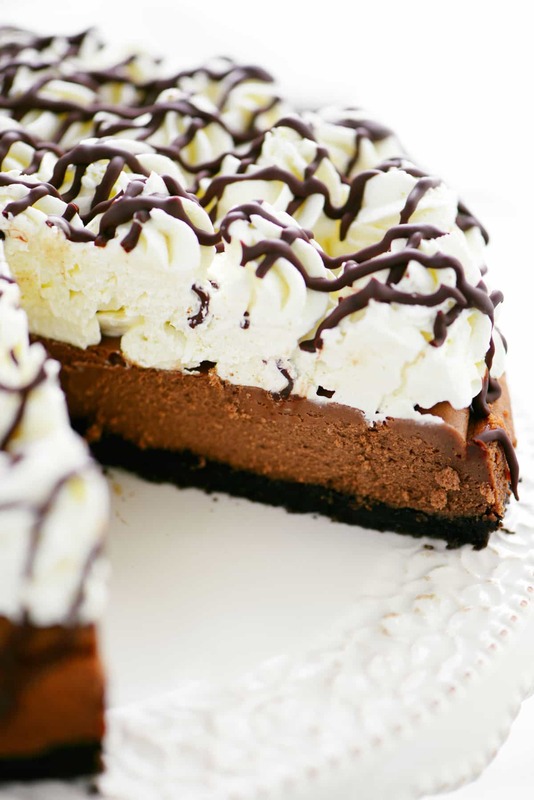 This cheesecake is a must for chocolate lovers! Dang, girl! You made this cheesecake look awesome! 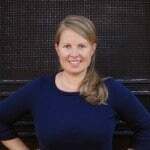 Thank you so much for sharing about my new cookbook! I appreciate it so much!! !